The book explores different pathways of experimenting with biology and architecture in the new field of Living Architecture. It takes architectural visions of a self-growing house and looks at growth patterns and dynamics from nature to apply them to architectural visions. 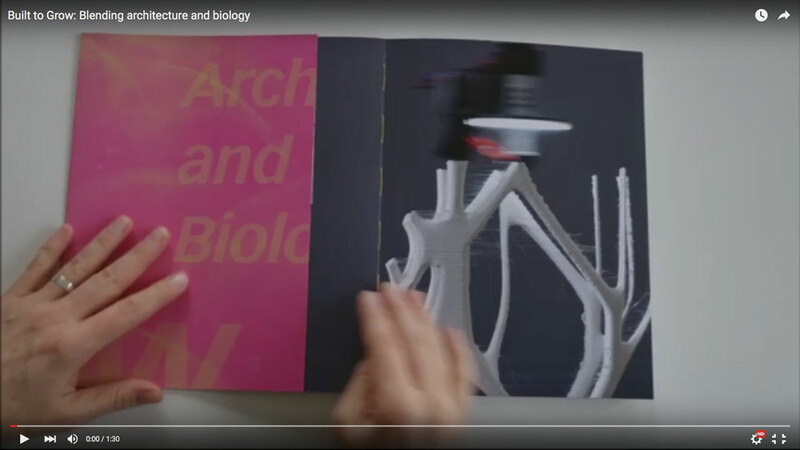 The book presents ideas, approaches and concepts for grown structures developed by an interdisciplinary team from the fields of architecture, art, biology, robotics and mechatronics. The core part of the book establishes the relevance of the two and a half years artistic research work conducted under the project name GrAB – Growing As Building. This includes hands-on experiments in a biolab with biological role models such as the pathfinding slime mould, mycelium structures and metabolic systems around a novel 3D mobile printer. Excerpts from conversations with different experts about agency, emergence and resilience, and a discussion about the immanent values and ethical aspects of this research are reflected to contextualise the work within our world of change.